There are dynamic collaborations and initiatives supporting regional growth strategies across the country. Today, I addressed a group of entrepreneurs, venture capitalists and technology commercialization leaders brought together by Technology Ventures Corporation during their Deal Stream Summit. This premier conference seeks to facilitate investment partnerships between federal labs, start-ups, innovators, and the venture community to bolster commercialization of technology and increase competitiveness. I discussed the Obama administration’s commitment to advancing innovation and accelerating the commercialization of new technologies to the marketplace. Earlier in the day, I visited the Sandia Science and Technology Park in Albuquerque, New Mexico. 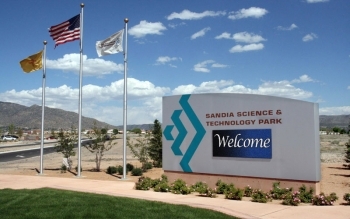 With their focus on advanced technologies, technology parks such as this are vital to America’s economic future. These public-private ventures bring together innovators with entrepreneurs and transform theoretical ideas for the marketplace. It’s quite a dynamic environment for the businesses located there, such as ATA Aerospace, Emcore Photovoltaics, and Nanogenesis. And the end results? They include the development of new and unique products, the creation of high-quality jobs, the growth of vibrant communities, and an improvement in the quality of life—both in the immediate region and well beyond. Hundreds of small business owners, community leaders, and state and local elected officials in Atlanta, Georgia, convened during the first in a series of White House Community Partnership Summits today for the opportunity to meet face to face with senior Obama administration officials and discuss key local issues. I had the pleasure of representing the Commerce Department and engage participants about steps the administration is taking to promote economic and job growth in Georgia and across America. I especially enjoyed the open space dialogues where participants set the agenda and identify action steps with officials. Today, I was pleased to join St. Louis Mayor Francis Slay and colleagues from the U.S. Small Business Administration (SBA) and the Department of Labor’s Employment and Training Administration (DOL/ETA) at an event to spotlight federal investments that are catalyzing the growth of the critical, job-creating St. Louis biosciences cluster. The day was focused on the partnership between the St. Louis County Economic Council, the St. Louis Agency on Training and Employment, and the St. Louis Minority Supplier Development Council to establish the St. Louis Biosciences Jobs and Innovation Accelerator project. With more than $1.8 million in federal investment, including $702,765 from EDA, $973,015 from SBA, and $150,000 from the DOL/ETA, this project will work to accelerate the growth of the region’s biosciences cluster and spur the formation of new companies and associated job creation. EDA’s funding for the project will bring early-stage technologies into the commercialization pipeline by addressing identified gaps and challenges, including access to a skilled workforce of experienced entrepreneurs that are needed to enable companies to grow. The Seattle region is noted as one of our nation’s hotbed of innovation and entrepreneurship with world-class cleantech, health sciences, biotechnology and advanced manufacturing clusters. It is home to the headquarters of companies like Microsoft, Amazon and Starbucks and its regional assets are fueling job growth. This week, I traveled to Seattle to spotlight Obama administration investments to advance these critical innovation clusters, promote entrepreneurship and small business development and create the jobs and industries of the future. 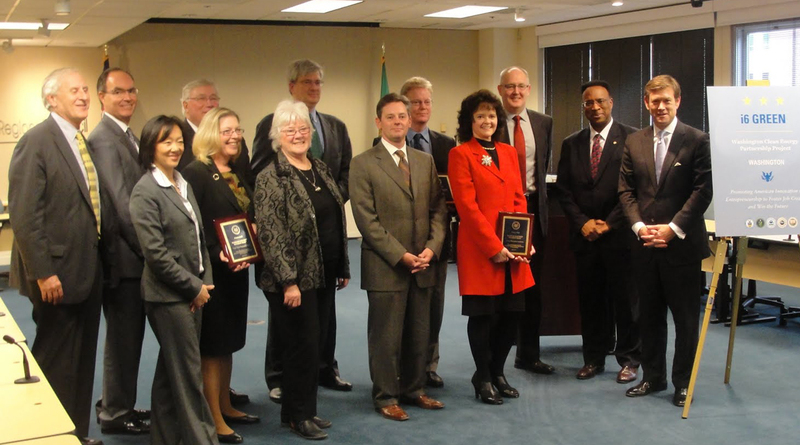 I met with the leaders of the Washington Clean Energy Partnership, awardees of the i6 Green competition. 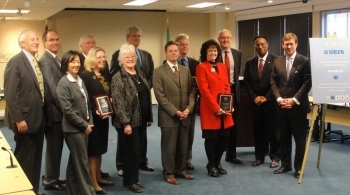 This collaboration between the Puget Sound Regional Council, South Seattle Community College, Cleantech Open and the Innovate Washington Foundation will work to foster collaboration between industry and institutions of higher education to expand the clean energy cluster. This will spur the creation of new jobs, companies and export opportunities in the market for energy efficient technologies.